Quirifino Z has successfully competed for several years with Ben Maher coming 4th in the Hickstead derby, among other numerous winnings at Grand Prix level, including competing on the Global Championships Tour 2009 & 2010. A list of the results and videos of these shows can be found on the Global Championships Tour webpage. Quirifno Z was selected for the World Class Equine Pathways Programme in 2008. Ben has the highest regard for this horse and says "Quirifino is careful, scopey, determined, has the desire to leave jumps up and win" Quirifino Z has a very calm attitude and is always very keen to work and please. He is graded with approved status with the AES Studbook & featured in the 2008 / 2009 Yearbook of German Sires; Ausgewahlte Hengste Deutchlands (Select Sires of Germany) - Click here to view .. Quidam de Revel, Quirifino`s sire, is one of the most influential breeding stallions of all time, for many years he has been in high demand and commanded record stud fees. His offspring are highly sought after as they have huge scopey jumps, but remain ultra careful. In 2004, Quidam topped the World Breeding Championship Jumping Stallion ratings for the second year, establishing him as the pre-eminent (and most expensive) living sire of show jumping horses. Quidam`s international influence is noticeable with his offspring winning the German Show Jumping Championships and the Dutch Championships. Ten of Quidam`s offspring competed at WEG in Spain. During Quidam`s competitive years, he won many Grand Prixs and he was fourth in the 1992 Olympic Games. 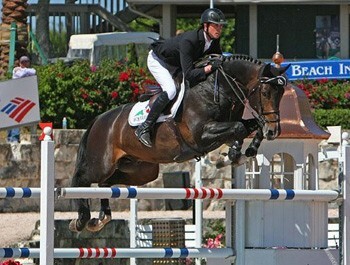 Grosso Z has produced international jumping star Goldfever and the international dressage stallion, Goethe. Goldfever has competed under Ludger Beerbaum in two Olympics, a Continental Championship, a World Cup Final and is still competing and winning! Grosso Z is a descendent of the Hanoverian `G` line and a product of L?on Melchior`s Zangersheide. Grosso Z was crowned the Champion Stallion of Belgium and the Champion Stallion of the Stallion Performance test.